Brooke Henderson gives some pointers on the range at the Wascana Country Club in Regina, on June 18, 2018. Brooke Henderson stood at the Wascana Country Club podium and looked over at the CP Women’s Open trophy, resisting the urge to pick it up. She may not have earned the right to do that yet, but veteran Lorie Kane thinks it’s only a matter of time. Henderson will aim to be the first Canadian since Jocelyne Bourassa in 1973 to capture the women’s national championship when Regina plays host to the tournament from Aug. 20-26. Kane, from Charlottetown, will be competing in this year’s event for a record 28th consecutive time. She said that Henderson’s legacy is just beginning. “I know, mark my words, that child will have that trophy in her hand at some point in her career,” Kane said. The 20-year-old Henderson has six career victories that includes one major title at the 2016 KPMG Women’s PGA Championship. Henderson won earlier this year at the Lotte Championship in Hawaii in April. She dedicated that victory to the Humboldt Broncos junior hockey team, which was involved in an April 6 bus crash that killed 16 people and left 13 others injured. Henderson said that seeing the progress on Twitter of some of the survivors has been incredible. She added that she’s not sure whether she’ll wear a green and yellow ribbon once again in August like she did when she won the Lotte Championship. “I’m glad I was able to win it for them and being here in Saskatchewan, to win another one and dedicate it to them would be truly special as well,” Henderson said. 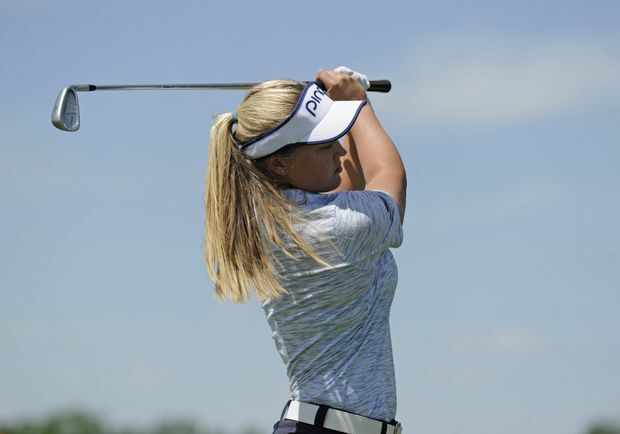 The Smiths Falls, Ont., native nearly missed the cut at last year’s CP Women’s Open at her home course in Ottawa, but birdied on her final hole of the second round to qualify for the weekend. The following day, she fired a course-record eight-under 63 to jump up the leaderboard and eventually finished the tournament tied for 12th. Henderson said that it will be a little bit different this year playing in Regina. “I knew almost everyone in the crowd it felt like,” she said of last year’s event. South Korea’s Park Sung-hyun won the 2017 tournament and is expected to participate once again this year. A total of 156 golfers will compete at the 2018 CP Women’s Open which has a tournament purse of US$2.25-million with the winner receiving US$337,500. Henderson is currently 18th in the world rankings and fifth on the LPGA’s money list this year with US$602,142. She had to withdraw from the U.S. Women’s Open earlier this month and head home to be with her family after her grandfather, Robert Moir, died from cancer on June 1. He was 81. Henderson admits that it’s been a challenging time since his death. She said that her grandfather was a big part of her life and that it’s sad to see him go.